Duffy and Poirier together in Dublin last week. 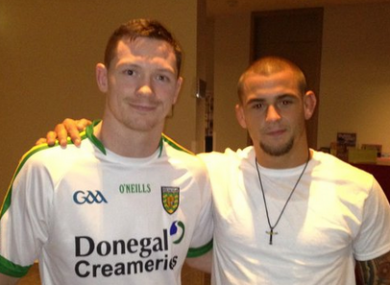 IRELAND’S JOSEPH DUFFY will fight Dustin Poirier at UFC 195, it has been confirmed. The lightweights were set to headline last weekend’s UFC Fight Night 76 at the 3Arena in Dublin until Donegal native Duffy was forced to pull out through a mild concussion picked up while sparring. Poirier was offered the chance to square off with Norman Parke on the night instead, but opted to turn it down — insisting that he had done the Antrim man a favour. Now their match-up has been resceduled for the MGM Grand in Las Vegas on 2 January. Headlining UFC 195 is welterweight champion Robbie Lawler and Carlos Condit, while heavyweights Stipe Miocic and Andrei Arlovski are also in action. Dustin Poirier vs. Joseph Duffy has been rescheduled for Jan 2nd at #UFC195. Email “A date has been set for Joseph Duffy's rescheduled UFC bout with Dustin Poirier”. Feedback on “A date has been set for Joseph Duffy's rescheduled UFC bout with Dustin Poirier”.